we are offering perma weather shield. perma weather shield is an acrylic coating, which provides weather proofing and heat insulation to the exposed roofs.the product is in a white paste form. perma weather shield is based on a acrylic binder and high quality non conducting . insulating fillers. weather shield when applied on the roofs it reduces the heat transfer to the interiors thereby reducing the load on air conditioning system. Primary uses : perma weather shield is especially developed for coating rcc roofs. it is also ideal for coating asbestos cement roofing sheets, galvanized zinc sheets as well as aluminum sheets. weather shield where brush applied on any roofing system forms a thick reflective and non-conducting barrier. for the sunlight. in summers its insulation value is highly beneficial in keeping the interiors cooler. in rainy seasons this acts as a waterproofing barrier. 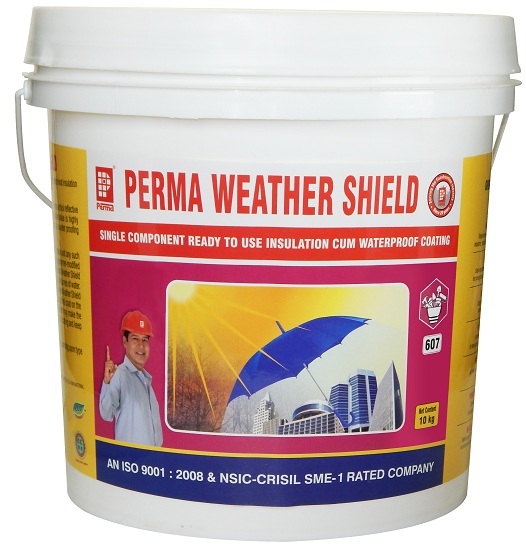 Packing : perma weather shield is supplied in 500gms, 1kg, 10kg and 50kg containers.